Interested in buying Original Art from me? Why not sign up to our Newsletter to be informed of the latest Art available to purchase. If you are looking to purchase Original Art from me, all pieces currently available will be added to this page. If you wish to enquire about purchasing any of them, please click on the button below to E-mail me direct about availability. 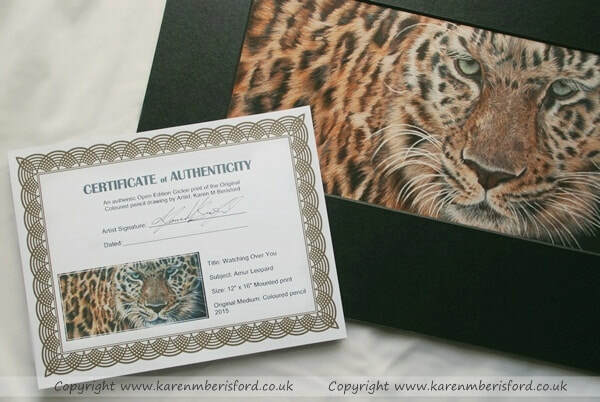 Description: A critically Endangered Amur Leopard created using high quality, lightfast Coloured pencils on ​300gsm heavyweight paper. Size Cm's: 39cm x 18.5cm ​plus 1.5cm bare edge for framing purposes. Like my Art but looking for a cheaper alternative? lightfast Coloured pencils on 300gsm heavyweight paper. ​Size inches: W12" x H10"
Size cm's: Width 30.4cm x Height 25.4cm plus 1.5cm bare edge for framing purposes. Apologies for the minimal offerings, more Artworks are currently in the works and will be added to this page as soon as they are available to purchase. Here are a few portraits that will be available for sale once complete with the possibility of Giclee prints too. All Artworks will be posted on this page once available. ​Each piece has its own progress page, so click any of the images to view.